Inner Workings (film, 2016). A 3D hand-drawn/computer-animated adventure short film with "G" rating by Walt Disney Studios Motion Pictures. Directed by Leo Matsuda. Official Trailer. 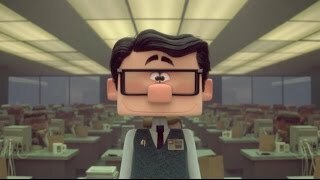 Inner Workings is a 3D hand-drawn/computer-animated adventure short film directed by Leo Matsuda. "Inner Workings" Short - Trailer. The short follows the inner workings of Paul, a man living in California during the 1980s. Paul's Brain, Heart, Lungs, Stomach and even his Bladder and Kidneys all awaken on a typical day for work. Heart expresses desires to try a large breakfast special at the urging of Stomach, play around on the beach, and try out a new pair of sunglasses at a stand run by an attractive female vendor. However, Brain simply wants Paul to get to work on time at Boring, Boring & Glum and avoid possible hazards that Brain thinks will kill Paul along the way. Fed up with Heart's constant sidetracked nature, Brain takes away Heart's control so that Paul can get to work on time. He and dozens of other employees sit at desks and enter data into their computers, moving simultaneously. Brain takes notice of the dreary routine of Paul's life and comes to realize that this cycle will eventually lead to his death as a sad, miserable, lonely man. The film Inner Workings was scheduled to be released by Walt Disney Studios Motion Pictures on June 17, 2016 (Annecy Animation Film Festival) and on November 23, 2016 (with Moana, United States). The duration of the film is 6 minutes. The film had received a "G" rating.